Today, Cydia got a nice face-lift and some nice new features. When you enter the “manage” page you will be given choices between mananging your packages and managing your sources. Manageing sources does not mean that you can add old installer sources. You still must have a valid apt source for Cydia. If you are a user and you do not want to see all the console applications, select “user”. “User” is similar to the level that most installer users are familiar with since installer did not contain a lot of development / hacking packages. Hacker displays the GUI apps as well as command line apps used in SSH or terminal. “Developer” will filter out nothing, showing you everything. Many “users” may find some of these packages annoying. This is why you now have a choice! You can later change this selection by going into “manage” and clicking on “settings”. 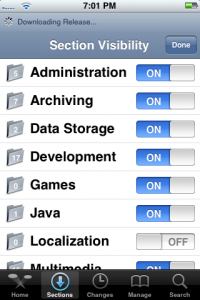 In addition, you can filter on “sections” (these are Categories in Installer). You can just tap the “edit” button on top of the “sections” page. If you tap that you will see this screen that lets you enable / disable various sections. Very cool, indeed.